Over three years ago I started writing about the Spark External Data Source API, first with two general posts: External Data Sources in Spark 1.2.0 and Filtering and Projection in Spark SQL External Data Sources. Efficient Spark SQL Queries to MongoDB. 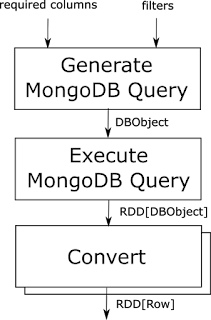 Spark MongoDB Examples via JDBC. I learned a lot by doing that, and apparently a number of people found the examples useful, but I never managed a systematic exploration of the original API and all of its capabilities -- something that didn't feel right, and that I always meant to go back to when time allowed. Use a "trivial" data source like the file system. This can actually lead to considerable insight, but it's not really amenable to exploring all aspects of the API. Provide my own [contrived] data source(s) that allowed covering all the concepts. I chose the third option, developing a rather simple key-value store called ExampleDB, in which I ignored the finer points like performance and persistence, and simply focused on developing a vaguely plausible API that could support the various examples. I'm expanding and refining ExampleDB as I add each example data source, and hoping I can keep it from becoming a monster. I decided to embed ExampleDB in each of the examples rather than starting a separate process like I did with the Kafka broker and Zookeeper in my Spark Streaming with Kafka project. However, to ensure that the data sources aren't "cheating" in the way they use ExampleDB, I only allow the data sources AND the example Spark jobs to call it via a remote API based on gRPC. Thus, the state of the RPC client needs to be managed carefully in the example data sources, making them realistic. Another major decision point was which language to use for both the data sources and the Spark jobs. (ExampleDB is written in Java, but that's really of no consequence as far as the tutorial value of the project goes.) Java friendliness seems to have been a major design goal of the new API, and indeed the interfaces that define the API are all Java interfaces. What language will developers actually use to develop data sources? I don't really know, but I think it depends somewhat on their role. I suspect that Spark developers who need to roll their own data source will often do so in Scala, in proportion to the general Scala/Java split in the Spark user community. However, I also suspect that database and file system vendors will prefer Java, since Java talent is so much more plentiful in the industry overall. That's a problem for me because both classes of developers are part of my target audience. So far, all the data sources are in Java, but I've provided all the example Spark jobs in both languages since that hasn't been very costly. All of these decisions are subject to being revisited as I see how much interest the project generates, and what seems to interest the community the most. While the V2 API is currently not documented much (except for JavaDoc comments in the interface sources), the Spark test suite does provide good coverage of the features. My examples are informed and inspired by many of the tests, but I've taken somewhat of a hard line on one design point that wouldn't have been important to the test developers. In the tests, you'll often see a single class implement multiple interfaces just for the sake of expediency. Sometimes they mix data that needs to be serialized for communication between the driver and executors with data that doesn't. That makes it hard to understand their communication behavior. As an example, consider the test data source JavaSimpleDataSourceV2 on branch-2.3. The inner class JavaSimpleDataReaderFactory implements both DataReaderFactory<Row>, which needs to be serializable and DataReader<Row>, which doesn't. An extremely simple data source that supports sequential reads (i.e. on just one executor) from ExampleDB. It only supports reads from a single, pre-defined table with a pre-defined schema. This data source is probably about as simple as one that reads from a remote database can get. As such, it is aimed at the developer who needs to achieve a simple integration quickly and easily. Another simple data source that supports sequential reads (i.e. on just one executor) from ExampleDB. It gets a table name from its configuration and infers a schema from that table. This introduces parallel reads (i.e. on multiple executors) from ExampleDB. The resulting Dataframe is partitioned appropriately. If the number of partitions is specified in properties, it is used. Otherwise, the table's default partition count (always 4 in ExampleDB) is used. This data source adds the ability to write data, and does so in parallel. The various classes for reading are identical to those of ParallelRowDataSource. All four values of SaveMode are supported. Each task writes to its own temporary table, and on global commit all of these temporary tables are copied into the destination table, and deleted, in a single ExampleDB transaction. The V2 API is marked experimental, and indeed a quick look at the Spark source code on GitHub reveals that some (apparently minor) refactoring has already happened since the 2.3.0 release, and we should probably assume there will be more before the 2.4.0 release. I'll try to track releases as quickly as I can until the API stabilizes. Given the challenges this project presents, I may need to change my approach over time, and I hope to get feedback from you about how well the approach is working. Apache Storm is a distributed stream processing framework: one of many such frameworks but among the most popular. Storm applications ("topologies") are composed of "spouts" (sources of data) and "bolts" (data transformations), and these are connected by "streams" of "tuples", which are a sequence of typed key/value pairs of data. The spouts and bolts can be thought of as vertices in a directed acyclic graph, and the streams as edges. The spouts are always graph sources, with only outgoing edges, but the bolts may have either both incoming and outgoing edges, or they can be sinks, with only incoming edges. Storm provides various pre-defined components, most of them spouts, providing standard data sources for streaming data from database systems, file systems, queueing systems and network listeners such as a web server, and so on. Similarly it provides pre-defined bolts, some serving as data sinks along the same lines, as well as interfaces to the usual logging frameworks. In this post I'm going to examine what it takes to do a good job of adding reusable transformers (in the form of utility bolts) to Storm, for use by topology developers. Storm already provides a number of these, mostly in the package org.apache.storm.starter.bolt, and a few more in the package org.apache.storm.testing. (Storm follows a convenient naming convention where all bolt class names end with "Bolt".) Alas, most of these are completely undocumented, at least in the JavaDoc, but many are quite simple, and their usage can be worked out from a quick read of the source. Standard transformations can provide simple operations like projecting out unwanted fields, or much more complex ones like filtering, aggregation or data smoothing. Since sometimes spouts and bolts have common or interacting design issues I'll occasionally touch on the design of spouts, but that's a complex topic in itself that is mostly out of scope for this post. Since this is intended to be a practical guide for writing reusable bolts, I'm going to assume that you already understand the basic mechanics of writing a very simple bolt and getting it working in a Storm topology. A good source for learning how to do this is the book "Storm Applied: Strategies for real-time event processing" by Sean T. Allen, Matthew Jankowski, and Peter Pathirana. I'm also assuming that you have the most basic familiarity with Storm's Java API. You may want to read this in conjunction with the storm-gadgets project on GitHub, which includes a small number of bolts largely developed using the design principles described here, although I'll leave detailed discussion of the actual code to another post. Ease of use: The purpose and behavior of the bolt should be clear and it should be easy to set up and include in a topology. Appropriate Generality: When designing reusable components of any kind there's a tradeoff between ending up with lots of similar components on one hand, and components with complex configuration on the other. When adding components to an existing framework it helps to "blend in" with how existing components have handled this compromise. Another facet of generality is adaptability to as wide a range of topologies as possible, in terms of variations like concurrency support, reliable delivery support, tuple contents, and so on. Robustness: Good choices need to be made about what kinds of errors are tolerated and which lead to topology execution failure. Here again the pre-existing components can be a guide. Furthermore, in the streaming world it's very expensive to allow bad input data or a localized problem to terminate the application. It's usually best to avoid interrupting stream processing in all but the most severe cases: anything that prevents the successful processing of a large fraction of tuples. Ease of Diagnosis: It's important to be able to diagnose misconfiguration of these components as well as failures, or other faults, during their execution. Again, existing components can be a guide here, but broadly we want to be able to read the usual logs and see what is happening in each component – easily being able to zoom in on a specific component type and/or component instance. The reader of log messages needs to be able to understand the scope and severity of each reported problem, and ideally what to do about it: fix bad configuration, restart the topology, solve an environmental problem, etc. Performance and Scalability: In addition to the component itself performing well, it should not detract from the performance and scalability of the topologies that use it any more than necessary. To meet the above component design goals in the Apache Storm framework, we need to address certain technical issues. I'll leave performance and scalability to a separate post, and address the functional issues here. As mentioned earlier, this discussion will occasionally refer to the Java API, although that's not the only option for implementing bolts. Distinguishing between inputs: A component may take inputs from multiple other components, and will often treat those inputs differently -- that is, they have different roles in the operation of the component, and so the topology developer will need to be able to specify which input stream has which role. Furthermore, upstream components may be emitting tuples on multiple streams, and sometimes multiple output streams of a single component may be consumed by our component. In Storm, streams have names local to the component that emits them, and components within a topology live in a flat namespace where they have global names. Storm provides the class org.apache.storm.generated.GlobalStreamId for dealing with this two-level namespace. In short, the component must support dealing unambiguously with the names of streams. Organizing outputs in a consumable way: Our own component may need to generate multiple output streams, in which case they need to be named. Even if there is only one, there may be reasons not to simply use the default output stream (whose name is, aptly enough, "default".) Sometimes it will make sense to generate the stream names ("out1", "out2", …) but in other cases they will need user configuration to fit them into a topology. The fields in output tuples will also need names, which may be fixed or generated in some cases, and need to be configured in others. This can be a lot for the user to configure, and the decision as to what needs to be configured should be made carefully. Finally, there are cases where it may be tempting to choose the output stream and field names based on the input stream and field names. There are two problems with this. First, while it may seem like a great way to avoid configuration altogether, Storm spouts and bolts are required to declare their streams and fields (and the order of fields) via the declareOuputFields() callback when the topology is initialized. Second, while it is often practical to use the configured names of inputs as names of outputs, you need to watch out for collisions – multiple input components may use the same stream name, and multiple streams may use the same field name. In short, simply passing input names through as output names is not a viable bolt design strategy in Storm. Interoperating with Guaranteed Delivery: The degree to which a topology achieves guaranteed delivery of tuples depends on its configuration, as well as the behavior of the spouts and bolts. Spouts need to assign IDs to tuples, bolts need to anchor their emitted tuples appropriately with respect to input tuples, and all components need to acknowledge tuples appropriately. Spouts have to implement the ack() and fail() methods, which also impacts the nextTuple() method, as emitted tuples need to be stored, keyed by their tuple ID, until they are either acknowledged (and then deleted) or failed (and then replayed.) Finally, bolts that communicate with external systems such as databases or queueing systems will need to "fail" the tuple when operations on external systems fail, so that it will later be replayed. When developing a utility component, we don't know whether guaranteed delivery will be used in a particular topology -- it usually needs to support either behavior. Fortunately, if we develop the component as if guaranteed delivery will be used, it can also be deployed without it. As we will see below, doing this sometimes it raises complex design issues. Concurrency: It is straightforward to write components in a way that allows Storm to operate multiple instances in parallel, but problems arise when we use these components in a topology and try to decide on what grouping method to use to connect them. Often a shuffle grouping will work – in particular, if the bolt processes each tuple completely in isolation from others. It gets more complicated if the order of tuples is significant to the bolt, or they need to be grouped in some way – then often a fields grouping is appropriate. This is all in a day's work for Storm topology developers, but it requires understanding the behavior of each spout and bolt. As utility component developers, it's up to us to understand our component's behavior well enough to document the grouping requirements it imposes, and sometimes this can be complex as it may be different for different inputs. Spouts have additional responsibilities with respect to concurrency, as the various spouts reading from an external data source need to divide the data among themselves. When reading from a queue, this is straightforward, but if reading from a DBMS they may have to work out how to explicitly partition a table. Error handling: The issue of error handling in streaming applications is complex and covering it completely in this post seems impossible. As utility component developers, however, we need to understand and document how our component interacts with system failures in the topology around it, and also what it considers "invalid" configuration and "invalid" input data. Misconfigurations should usually be reported when a component is initialized (from the constructor) or during the call to prepare(), as they should, if at all possible, be reported before the topology starts to execute and should, in most cases, prevent it from executing. One major kind of misconfiguration that components should always check for during initialization is whether an appropriate set of input streams and output streams have been configured -- there's usually no point starting to execute data if they haven't. This is also a good time to check for groupings that can't be supported, concurrency levels that can't be supported, as well as combinations of grouping and concurrency. Invalid tuples are a different matter: unclean data is a regular fact of life, and data pipelines should recover and continue executing whenever possible after an invalid tuple is received. This can be either very simple or complex depending on the nature of your component. One thing to remember is that if you effectively drop a tuple for being invalid, you still need to acknowledge it so it doesn't get replayed when guaranteed delivery is being used – this can feel counterintuitive but is very important. There remains the issue of reporting the problem to support diagnosability. It's important to be able to monitor whether the number of tuples (absolute or as a proportion of data processed) each component has rejected is very small or very large. In the latter case, hopefully an administrator should be alerted to check whether there is a major, systematic configuration or data source problem. Sometimes the administrator will have the luxury of stopping the data pipeline, but often this is out of the question. Millions of tuples may be rejected before an upstream problem is solved, and you don't want your alerting mechanism to cause more problems than it solves. For example, logging every rejected tuple can seem like a good idea, and indeed be very useful, until the logs fill up a storage device or the logging slows the topology to a crawl. Logging needs to be used judiciously, and logging the occasional rejected tuple is probably still a good idea. Logging the number of rejected tuples from time to time can also be useful. For some components, particularly those that are "fussy" about their inputs, it may make sense to output something (perhaps a count, or an error message) on a dedicated output stream whenever a tuple is rejected. It may even be tempting to output the entire tuple, but this is not straightforward. Since the field signatures of a component's output streams need to be pre-declared, it's hard to emit an unexpected field. One approach is to serialize the entire rejected tuple into a single field, perhaps called "tuple", perhaps in a serialization format that is both machine and human readable. Logging: Storm now uses SLF4J for logging, and it's straightforward for individual components to use it as well. Any logging done on a per-tuple basis should be at the DEBUG level so it can be disabled in production. Major component lifecycle and configuration events should be logged as INFO as it's cheap to log them and they should always be available. One aspect of logging to be aware of is that a component can only become aware of its ID in the topology when prepare() is called. If you want to use it for logging elsewhere (and you will) you need to save it at that time. Furthermore, not only is the ID not known in the constructor, but it is also not known in declareOutputFields(), which is called before prepare(). If it seems useful for the association between the component ID and its configuration (and perhaps output fields) to be clear in the logs, you may want to log it all inside prepare() even though it was already available in the constructor and it may have been tempting to log it there. Interactions with external systems: Spouts often read data from external systems and bolts can read or write data from/to such systems, or both. To do this responsibly, they should not overuse the resources of those systems, including connections. This includes limiting the number of concurrent connections, disconnecting responsibly when cleanup() or deactivate() are called. As mentioned earlier, it needs to be clear what happens when multiple instances of a component read from the same database table – are they replicating the data or partitioning it? An additional complication to keep in mind is that when guaranteed delivery is in play, the input tuple to a component may be replayed -- it's necessary to think through what effect this will have on the external system. You can make up your own mind as to how well the bolts in the project meet the design goals and conform to the implementation guidelines: I'll discuss some of them in detail in future posts. If you have bolts of your own that raise interesting issues, or feedback on the ideas discussed here, please let me know. I recently wrote about the unexpected popularity of the LearningSpark project on GitHub, and speculated that some of the popularity stemmed from the convenience of not having to set up a Spark server -- each example program is more-or-less self-contained. This approach has certain limitations (for example, it's an awful way to explore performance and scalability issues) but it does leave people free to concentrate on model and API issues in isolation. This can be useful not only for Spark beginners, but also, as Spark evolves, it's a good way to understand the new features and the problem solving approaches they support. Sooner or later, a large fraction of Spark users end up grappling with how to use Spark in conjunction with Apache Kafka. Now, the overheads of setting up both a Spark cluster and a Kafka cluster before you can write the stream processing equivalent of "Hello World" can be quite high, especially if you're still learning BOTH systems. Being in this situation myself, I started to wonder how hard it would be to set up a project where both the Spark system and the Kafka broker (and ZooKeeper instance) were embedded in the example program. Such an approach would have the same limitations as the Spark project described above, and probably suffer from them even more, but conversely, the benefits of such simplification would be even greater. It turns out not to be very hard to achieve, as you can see at another GitHub project, spark-streaming-with-kafka, but it does have certain gotchas, which I'll discuss. It seems to me that the Kafka project has suffered rather considerable API churn, not just in the details of the APIs but in the fundamental conceptual model as well. Currently in Spark 2.0.0, released in July of 2016, Spark support for the APIs is lagging somewhat, supporting Kafka 0.8.2.1, released in February of 2015. This seventeen month lag causes some minor difficulties, although the situation seems likely to improve in Spark 2.1. The main impact of this lag in API support is in the area of the kafka-unit project, which provides convenient APIs for managing an embedded Kafka instance. This project is now at version 0.6, but to get a release that supports Kafka 0.8.2.1 we have to go back to kafka-unit 0.2, which is missing some handy newer features like creating partitioned topics. I've had to work around this in one of the utility classes discussed below. So far, I have needed the following utility classes to keep the examples sane. Note that these links point to a version of the code specially tagged to provide permanent links: keep this in mind if you want to see more recent versions of the code. EmbeddedKafkaServer: Encapsulate uses of the kafka-unit project to embed a Kafka instance, working around the fact that, as disucssed above, we have to use a rather old version of that project. SimpleKafkaClient: Some trivial default configuration for the producers and consumers used in the examples. SparkKafkaSink: An extension of the code provided in Marcin Kuthan's rather useful blog post about publishing to a Kafka topic from a Spark job.His code uses the default partitioner, essentially broadcasting the contents of each RDD partition to all of the topic partitions, effectively causing a random repartitioning. 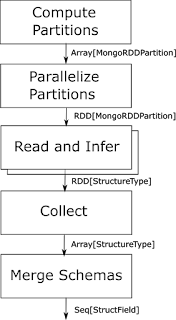 The additional overload of the send() method here instead allows the topic partition to be specified, so the contents of all RDD partitions are sent to the same topic partition. I'm not sure this is useful in practice, but it helps to illustrate the relationship between RDD partitioning and topic partitioning. So far, the following five examples are available. Once again, the links point to a tagged version of the code. SimpleStreaming: The most basic streaming example: starts a Kafka server, creates a topic, creates a stream to process that topic, and publishes some data using the SparkKafkaSink. For each of the received RDDs, the code prints the number of partitions and the number of elements in each partition. The code exercises no control over the partitioning of the received RDDs, and there turn out to be two partitions each time, compared with four in the originating RDD and four in the topic. By examining the partitioning here, we set the stage for exercising some control over it in later examples. Notice there's quite a lot of waiting. It takes some time for streaming to get going, and data published too early tends to be missed by the stream. (No doubt, this is partly because this example uses the simplest method to create the stream, and thus doesn't get an opportunity to set auto.offset.reset to "earliest".) Also, data that is published takes some time to propagate to the stream. This seems inevitable, and is almost guaranteed to be slower in a self-contained example like this. ExceptionPropagation: This example demonstrates that exceptions encountered in stream processing are rethrown from the call to awaitTermination(). The custom exception SomeException is thrown when an RDD is received. PartitionedStreaming: By calling createDirectStream() instead of createStream(), you can get the generated RDDs to have a number of partitions (in this case 6) dictated by the partitioning of the topic. ControlledPartitioning: Here the topic has six partitions but instead of writing to it using the configured partitioner, we assign all records to the same partition explicitly. Although the generated RDDs still have the same number of partitions as the topic, only one partition has all the data in it. This demonstrates how to exercise control over partitioning all the way from the original RDD, through the topic to the resulting RDDs. Personally I've found this project useful in improving my understanding of Kafka itself, as well as the Kafka integration features of Spark Streaming. It's always hard to tell which of these projects are useful to others and why, so I look forward to hearing from you about your experiences with the code. In a recent post I discussed the history and motivation of my LearningSpark project on GitHub. While that project is mostly based on the Scala APIs to Apache Spark, I explained why I had begun to explore the Java APIs as well. I also predicted that I would soon introduce a separate project, based solely on Maven and Java, to continue the Java exploration: most Java programmers are much more comfortable with Maven than with sbt, and a separate project allows me to choose the Java version appropriately. The new learning-spark-with-java project on GitHub is the result. It started with a copy of the examples on the original project, but since I've now adopted Java 8, I rewrote the examples to make use of the latter's lambda expressions, perhaps ironically making the code now look more like the original Scala code. I'll probably still focus on the Scala examples more, as new features seem to mature a little faster in the Scala API. I am unlikely to add to the Java examples in the LearningSpark project, and if they get in the way or create confusion, I may eventually delete them. As always, feedback is welcome, and I'm especially curious to see whether the community finds this project as useful as some people obviously found the earlier one. Almost two years ago, while preparing for a talk I was giving at the now defunct Seattle Eastside Scala Meetup, I started a public GitHub project collecting and organizing Apache Spark code examples in Scala. I had stumbled on a way to run the examples on all supported platforms without setting up or deploying to a cluster, so the overheads of experimenting with the Spark APIs and programming idioms were remarkably low. It seemed like this approach was not well known at the time, so I shared it via the GItHub project and by posting here. Other than avoiding the overheads of a Spark cluster, the main feature of the project has been a "baby steps" approach to the examples. I've tried to demonstrate each API feature with multiple, slightly varying examples and (with notable, unfortunate exceptions) comments, to build intuitions before leaving the readers to take their chances with the Scaladoc. Two years and about sixty sample programs later, I'm still not sure of the project's role and future, except that it has been tremendously helpful to my learning about Spark and Scala. The Apache Spark project's documentation and examples have improved, as has test coverage -- the latter always being a good way to learn about a new feature, except when there isn't any. The Databricks blog has also made a difference. And yet, the project continues to be useful to me, and I occasionally hear from others who find it helpful, including one local company that uses it in their training program. I like the "baby steps" approach to learning an API, and apparently I'm not the only one. But lately I've had to ask myself some hard questions about the project. As I hope to post separately about soon, the evolution of Spark SQL's object model (remember SchemaRDD?) has made the task of keeping the project organized rather challenging lately -- I don't like to move examples around so I don't break links from the blog, StackOverflow and elsewhere. Another problem that's been nagging at me lately is my choice of Scala for the examples. I enjoy using Scala, have enjoyed learning it, and the Apache Spark project continues to keep the Scala APIs as a first class citizen. Indeed, Spark is written in Scala, but as I'll discuss later, that's no guarantee of strong support for Scala APIs. I've never been interested in the Python or R APIs, even though I believe they're of tremendous importance to the industry: I'm not part of the target audience (broadly, the data scientist) and I don't enjoy programming in either language. That leaves Java. Java is clearly an important part of the Spark ecosystem, as the surveys show. The Java APIs are not merely an afterthought in Spark: real effort seems to have been invested in making Java programming practical and a reasonable approach. While even a quick examination of the Spark project's Java examples (which date back to Java 7) shows them to be verbose and awkward compared with the Scala examples, the introduction of functional programming features in Java 8 raises the possibility of Java catching up. I see a certain hesitation about Scala in the "big data" ecosystem. Lightbend has taken the "we don't have to choose" approach, and seems to be pretty sincere about it -- and of course they should be if they believe their own survey results. Confluent's decision about Apache Kafka is a bit more interesting: Kafka is also written in Scala, but only supports a Java API, with others provided by the community. While Cake Solutions actively develops the scala-kafka-client project, the Scala APIs are definitely not a first class citizen. I've been a Java programmer, on and off, for 18 years. Before Scala, it was my recreational language of choice, and I still like it. I'm curious about Java 8, which I've only used a little, for another recent project. Together, these certainly don't motivate me to abandon Scala, but they do motivate me to understand the tradeoffs better than I do now. The bottom line is that I've started adding some Java examples to the project, and started marking my commit messages with "[Scala]" or "[Java]" as appropriate. I'm definitely making this up as I go, so let me expose some of the decisions I'm trying to make. I started with Dataset and DataFrame, since I had recently worked on those in Scala. But I'd at least like to get a cross section of the different areas: core RDDs, SQL, streaming and perhaps GraphX. Then I'll probably focus more on the areas that bring out interesting differences, whichever they turn out to be. There's no point exploring Spark SQL as a query language comprehensively in both Java and Scala, so I won't do it in Java. This is easy: much of the reason I invest in the project is to keep up with Spark evolution, and it takes a lot of effort. I'll continue adopting each new Spark release as soon as I can, and use its new features. Java 8 seems to be getting a lot of adoption, and the new features definitely make it better suited to Spark. But the APIs have a number of features that were intended to work around the deficiencies of earlier versions of Java (such as all of org.apache.spark.api.java.function), so it seems interesting to explore them for a while. Yet I'll probably change to Java 8 soon to keep the project from becoming a museum. One or Two Projects on GitHub? As I mentioned earlier, the evolution of the object model around Spark SQL has made it hard to keep the project organized, and the Scala examples are getting out of hand. I'm not going to inflict this entropy on Java developers, and will try to organize the Java examples according to my current understanding of how Spark fits together. In due course this may help me sort out the organization of the Scala examples too -- in any case I'm hoping to write a separate post on this topic. I don't know how much I'll balance my effort on Scala and Java examples, or even whether I'll keep working on the Java ones for much longer. It depends on feedback, how much insight I get, where the community ends up going, and how Java and Scala (and Spark) evolve. I've already made this decision: definitely not. It's now my recreational language of choice, and I think it has a future. At the very least, I plan to keep up my attempts at covering major Spark features in Scala as they evolve. While my "baby steps" approach to Spark examples seems to have had some impact on the community, I get very little direct feedback. Occasional questions have inspired some of the examples, which I hope were helpful to those people, and one local professional who reached out and told me how he has found the project valuable has dramatically increased my motivation. I'd be delighted to hear about your experiences, either about the examples themselves, or about Spark in general. In previous posts I've discussed a native Apache Spark connector for MongoDB (NSMC) and NSMC's integration with Spark SQL. The latter post described an example project that issued Spark SQL queries via Scala code. However, much of the value of Spark SQL integration comes from the possibility of it being used either by pre-existing tools or applications, or by end users who understand SQL but do not, in general, write code. In this post I'll describe how to set up a Spark Thrift server with NSMC, and query it via JDBC calls. Let's begin by setting up a Spark Thrift server that has access to NSMC. A running instance of MongoDB. A running instance of Spark 1.3.1 or later that can communicate with the MongoDB instance. The NSMC JDBC Client Samples project, which I'll describe in some detail below. A configuration file that will be used to tell NSMC how to connect to your MongoDB instance -- we'll call it nsmc.conf. Where to find your Spark master. Where to find NSMC configuration -- in this case your nsmc.conf file. Skip the --packages setting when starting the Thrift server and instead use --driver-class-path together with the path to where you saved the assembly. Add an entry to your nsmc.conf file where the key is spark.executor.extraClassPath and the value is again the path to where you saved the assembly file. Most of the code is fairly mundane JDBC, and I won't attempt to write a JDBC tutorial. But I will step through some of the most interesting points. You may need to modify the connection string if you're running the Spark Thrift server on a remote host or a non-default port. Furthermore, if you've set up authentication you'll need to provide an appropriate user name and password. The most important part of the example is registering a MongoDB collection with Spark SQL. There are a number of interesting aspects. You need to register a temporary table, and thus you will need to re-register it if you restart the Spark Thrift server. Spark (as of 1.3.0) now supports persisting metadata for external resources like this in the Hive Metastore, but NSMC (as of v0.5.2) isn't yet capable of taking advantage of it. Because all connections to a Spark Thrift server run in the same HiveContext, registering a MongoDB collection once like this makes it available to all users until the server is restarted. It is the USING clause that tells Spark SQL to use NSMC for querying this resource. Since you told the Spark Thrift server to download an appropriate version of NSMC from the Maven Central Repository, NSMC will both set up the right metadata when a collection is registered, and then also process any queries to this table. You can register several different MongoDB collections, potentially in different databases, through multiple invocations of CREATE TEMPORARY TABLE. Alas, all connections must use the same MongoDB endpoint (host/port) with the same NSMC configuration. See NSMC Issue #15 for the status of the needed enhancement. The remaining code executes some simple DDL and DML queries, and should be clear if you've looked at the MongoDB collection and queries in the NSMC Examples project. You will recognize the following Spark SQL schema as being the schema that NSMC infers from the MongoDB collection. Since this schema has both arrays and nested structures, I want to spend the rest of this post focusing on how JDBC handles returning query results from such an aggressively non-rectangular (or non-relational) schema. As you have seen in my original Spark SQL post, Spark SQL itself deals with this extraordinarily well, but alas the Hive JDBC connector does not. The following simple query illustrates the issues, since billingAddress contains a nested document and orders contains an array. The following code allows us to see the values. Since all of the columns have been converted to strings, it's worth noting that the highlighted code could just as well have been replaced with res.getString(i). Here is the output. Notice that it is quite readable, and the JSON strings could be parsed by your client code if needed, especially since you can use the ResultSetMetaData to determine what to expect in the String. Whether this is "good enough" really depends on your needs. This actually works remarkably well. For example, if billingAddress happens to be null in some document, asking for billingAddress.zip also returns NULL, instead of generating an error. However, Spark SQL doesn't give you a good way to unpack arrays -- and yet there is a coping strategy for those too. Instead of returning one result row for each matching document, it returns one row for each order, with the custid joined on. The result is completely rectangular, and so is easy to deal with in your client code. First, you can see this in the "Type Name" of the metadata. Second, you can see it when you print the results. You can get more information about this technique in the relevant section of the Hive Language Manual. Using Apache Spark's Thrift server and NSMC's integration with Spark SQL, you can run highly distributed SQL queries against MongoDB collections, perhaps even performing joins between MongoDB collections and data stored elsewhere.